"Today, we’re turning Opera 56 from the developer line to beta. The build for today includes a new About page, and an easier-to-find link to the bug report wizard for Windows, and Linux users. We have created a new design for the About page in the Opera. The page provides useful information about your current version of Opera, as well as system information and installation, profile, and cache paths. 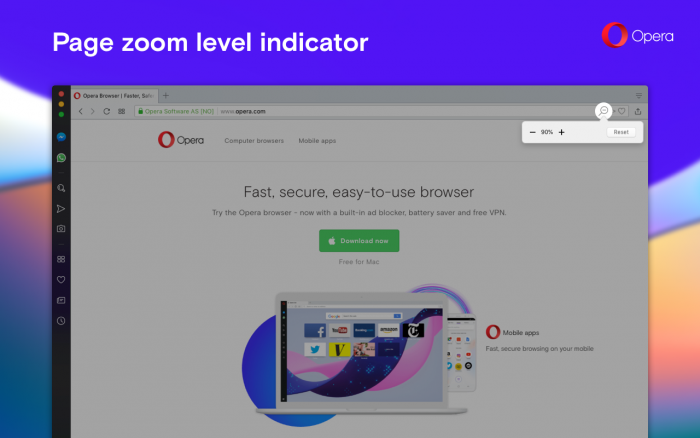 Legal information is provided at the bottom of the page, including our End User License Agreement, updated Privacy Statement, and Opera’s Terms of Service. If you wish to check for an available update to your Opera browser, go to Update and Recovery… in the O Menu for Windows and Linux, and Opera on the toolbar for Mac. Windows and Linux users can find an easier way to report any issues, experienced while using Opera. Click the O Menu button, and go to Help to find Report an issue… Click it to be directed to the Opera’s bug report wizard. There is a lot of thing happening in the ongoing development of Opera 56 right now, but we couldn’t turn it on in this beta version yet. Stay tuned for more news to come! Some bug fixes to note include repairs for the unit converters, and improvements to the Install Chrome Extensions toolbar on the Chrome Web Store. The Chromium has been updated to version 69.0.3497.42. "Today, two novelties and an option to turn on/off the quick scroll feature join the Opera 56 beta stream. Just like we had introduced on the developer stream few days ago, we added the page zoom level indicator in the combined address and search bar. If you change the level of page zoom, you will see a pop-up informing you about it. You can then change the zoom level by using +/- in the pop-up. If you have it set to the default for all pages, the indicator won’t appear in the address bar, until you change the zoom for one of the pages. You can adjust the zoom level for all web pages by going to Settings > Basic > Appearance > Page zoom. If you have adjusted it for an individual website, go to Settings > Advanced > Privacy and security > Content settings > Zoom levels. Opera developer users have already had the chance to see this, and they loved it! This is one of the most requested features in the last few weeks. 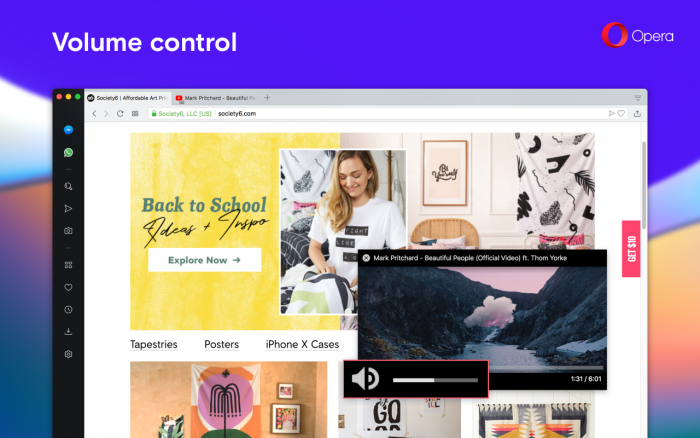 Now, you can also control the volume on your video pop-out in the Opera 56 beta. We’re giving you the possibility to turn on/off the quick scroll to the top of the page feature. We added this option in the Settings under Advanced > User interface > Scroll to the top of the page by clicking the active tab." The Chromium has been updated to version 69.0.3497.72. Hi @IgorEisberg-0, you can file a report here, it most likely should speed up the fixing of the issue. - Proper Opera icon on clear installation on Fedora. - Fixed bug with clicking on mute button on video pop-out (it does not had expected effect, when volume control was clicked before). - Some small UI changes on the Settings page. - Bunch of new translations."